As an industry leader, we believe in committing to environmental stewardship. We want to improve the way people live using our products. The more people live in an energy-efficient and sustainable way, the better it will be for our environment. Renewal by Andersen® of St. Louis talks about four of our environmental stewardship practices. 1. Environmentally Friendly Manufacturing – We manufacture the Fibrex® frames of our St. Charles, Missouri energy efficient windows from at least 40% reclaimed wood fiber. Since we first used this manufacturing process, we have saved over 90 million board feet of lumber. 2. Durable Materials – Our Fibrex frames are also immensely durable. Durability is important to sustainability because it prevents waste and saves l andfill space. Since our windows will protect your home for many years, you won’t need to replace them any time soon and consume more resources. Fibrex frames can st and up against harsh weather and they will not rot, corrode, chip, crack, blister, or peel. 3. Energy-Efficient Glass – Our High-Performance™ Low E4® glass is incredibly energy-efficient and will save you money and make your home more comfortable. It can save you up to 25% in your energy bills, as it prevents unwanted heat gain and heat loss. This keeps your interior at your preferred temperature. 4. Third-Party Certifications – Our windows undergo continuous testing by a variety of experts, including ENERGY STAR®, the National Fenestration Rating Council, and the Scientific Certifications Systems. These tests guarantee our windows performance. When you work with us during your windows installation in St. Charles, MO, you can be sure that our windows will help make your home a better place. 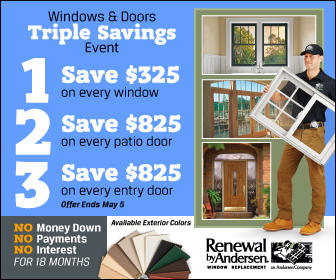 Renewal by Andersen has replaced over two million windows in over 300,000 homes through the years. This number is growing each day, and we do our best to help as many people as possible increase their home’s energy efficiency. Our replacement windows are durable, beautiful, and energy-efficient. They’re an excellent choice to save money and help the environment. Give us a call to learn more about the ways we help the environment, or to schedule a free in-home consultation.